The Philips 328E8QJAB5 is a stylish thin-bezel monitor with the ultra wide-color technology, FreeSync, and humble Full HD resolution. This curved VA panel display uses superior contrast ratio and steep 1800R curvature to fully immerse you into whatever activity you happen to watch on the screen. 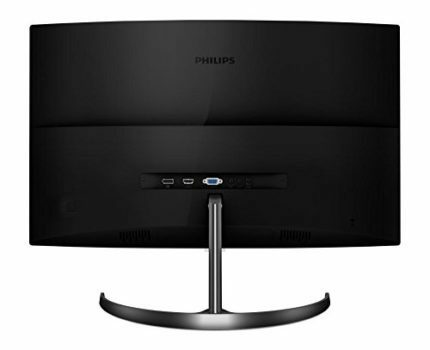 The Philips 328E8QJAB5 monitor features a Vertical Alignment (VA) panel which delivers a high-contrast image with expressively deep black tones, wide viewing angles, and a solid response time speed. The Ultra Wide-Color technology of the monitor provides 103% of the NTSC color gamut coverage which is over 100% sRGB – 126% to be more exact. Although the panel boasts this wide spectrum of colors, it’s not recommended for photo editing purposes due to its rather low pixel density of meager 70 pixels per inch. This is the result of the Full HD resolution used on its large 31.5-inch panel. 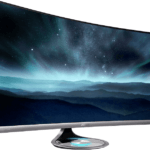 Nonetheless, the Philips 328E8QJAB5 display is aimed at casual multimedia users that seek a beauteous and curved panel to add elegance to their living rooms. Additionally, most of its features, such as FreeSync and SmartResponse, point that’s intended for casual gaming. With the adaptive-sync and 5ms response time speed, you will be able to enjoy smooth gameplay with minimal ghosting effects. The Philips 328E8QJAB5 offers plenty of game-enhancing features. The SmartImage Game feature consists of pre-calibrated picture presets for FPS, RTS, and Racing genres as well as of two customizable ‘Gamer’ profiles. This feature utilizes the dynamic contrast ratio, a response time speed override, and increases the visibility in the dark scenes. You can simply select the preset depending on the game that you’re playing or customize and save your own settings. There’s also the Low Blue Light mode which eliminates the harmful blue lights and in combination with the flicker-free screen allows for hours to an end of viewing without causing eye strain. Lastly, The Philips 328E8QJAB5 VA monitor features AMD FreeSync technology. If you have a FreeSync Compatible graphics card, you can synchronize its frame rate to the monitor’s refresh rate thus activating the dynamic refresh rate. Within the range of the dynamic refresh rate, screen tearing and stuttering is eliminated while input lag is reduced. The Philips 328E8QJAB5 is the latest addition to the E-Line displays where E stands for Elegance. 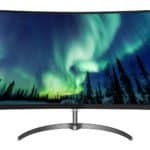 Philips has aimed this display at casual gamers and movie enthusiasts who are looking for an alluringly priced and designed curved panel. Its 1800R curvature will bring gamers closer to the game, surrounding them with action. However, due to its low pixel density, the image will look pixelated if looked from a short distance. As far as ergonomics are concerned, you can remove the stand and VESA mount it with 100 x 100 holes, but the monitor is tilt-only by -5, 10 degrees. The cabinet is black with gunmetal glossy finish while the screen is coated with a matte anti-glare treatment. Connector ports include a VGA, a DisplayPort 1.2, and an HDMI 1.4 port as well as an audio line-out for the headphones and line-in for the 2x3W built-in speakers. AMD FreeSync is supported via both HDMI and DisplayPort with the same 48-76Hz dynamic range. The Philips 328E8QJAB5 price is around $380 at the moment (July 2017) but it’s currently not available in the US. 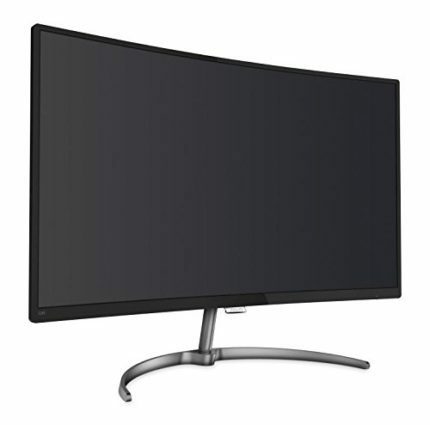 The monitor features a unique combination of specifications that will only appeal to a certain group of people that are looking for something in between a curved TV and a gaming monitor. 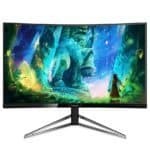 Samsung has released a similar monitor, the Samsung CF391, over a year ago which is now available at a considerably more affordable price. The Philips 328E8QJAB5 certainly looks like a mesmeric display but its wide color reproduction seems like a waste due to its too big screen size for its resolution. In addition, it’s too expensive for a 1920×1080 display. If only it offered a 1440p resolution or even 2560×1080 ultra-wide, the price would make more sense. This way, it will mostly appeal to those who simply can’t make their minds between a gaming monitor or a TV. Alas, it does look pretty, and the gaming features are calling out to run a few games and see how it actually looks – So, we may conduct a Philips 328E8QJAB5 review in the future.